It started with a subway brawl in Hong Kong. Despite signs and announcements prohibiting the consumption of food on the subway, a Chinese mainlander was enjoying a bowl of instant noodles in a subway car. One Hong Kong resident lost his temper, announcing that mainlanders have no respect for Hong Kong rules or way of life. See the video here and read details at the Shanghaiist (try not to be put off by the title “Bitchfight;” it’s got all the right links). In response, Beijing professor Kong Qingdong lambasted the Hong Kong people on television, saying that they lacked morals and were no better than dogs — imperialist Britain’s dogs, nonetheless. When the video clip went up on Youtube two nights ago (which is not blocked in Hong Kong), I watched as the comments poured down the screen, every few seconds an offended watcher decrying Kong Qingdong’s lack of tact. One wonders how much it was a simple matter of tact. It was first and foremost hate speech, and that is allegedly why it was removed from Youtube. But “hate speech” is not a phrase you hear in mainland China; “unusual”/”exceptional” are phrases more commonly used to excuse someone’s extreme opinion, if not couched in nationalist rhetoric (where “cultural difference” and “misunderstanding” are more often the words of choice). Indeed, hate speech is too often defensible in mainland if it is in response to insulting mainland culture as such (I am careful not to say “Chinese” culture here). For this reason, such rhetoric appearing on television, egregious as it may be, should not come as a surprise to China-watchers. 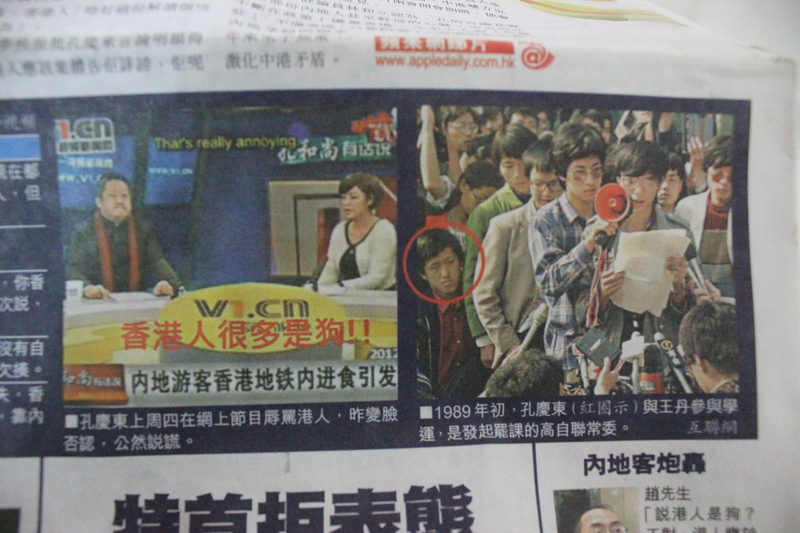 The extent of his involvement in Tiananmen organization is not known, but clearly it was not enough to have him exiled. Nonetheless it sheds a supremely interesting light on who he is and what he’s getting at. I sense a disillusioned, opportunistic post-Mao generation’er who has swallowed the poison of Beijing rhetoric in order to keep his own boat afloat. As it were, he probably is receiving some sort of under-handed kudos for having “defended” the Chinese people. 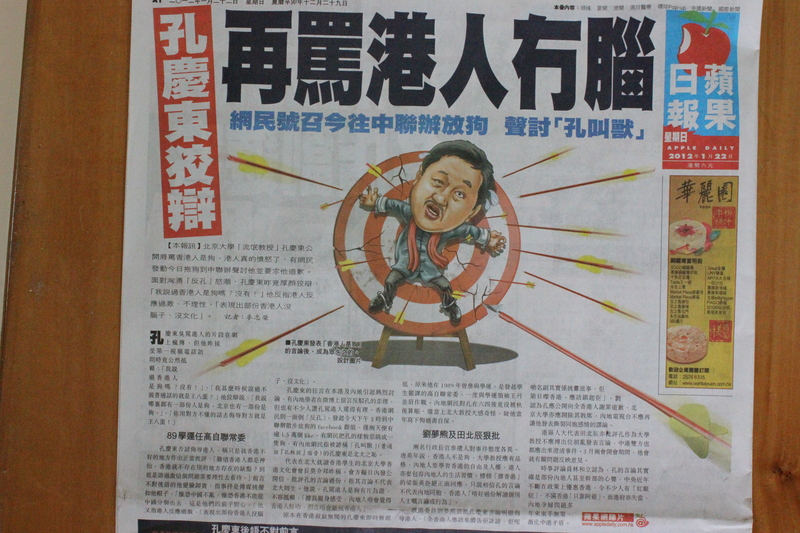 To say he is receiving bad press in Hong Kong is a royal understatement. Unfortunately, it is not likely to make any waves beyond Hong Kong island, what with censored media and 63 years of Maoist discourse dissolving such discussion at the border. 23 Jan	This entry was published on January 23, 2012 at 4:45 pm. 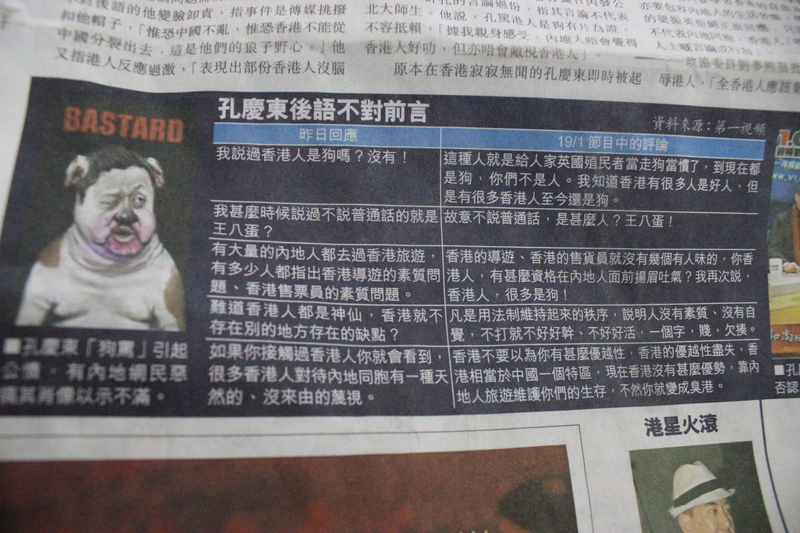 It’s filed under China, China politics, Chinese media and tagged calls hong kongers dogs, Chinese media, hong kong dogs, Kong Qingdong, nationalism, professor calls hong kongers dogs, 孔庆东. Bookmark the permalink. Follow any comments here with the RSS feed for this post.